These famous gigantic chocolate bottomed cookies are sent directly from Jacque's ovens to you! These signature giant chocolate chip cookies are over 5 inches in diameter and use Jacque's House Blend 60% Dark Chocolate baking discs. As he always says "It’s a lot of chocolate with a little cookie dough around it". Sold as one or two packs of 6 cookies in a bag tied with a vibrant ribbon. Jacques Torres is world renowned for his decadent chocolate treats available in his New York shops… and now on SimplyChocolate.com! Serving chocoholics around the world, the James Beard award-winning pastry chef crafts nostalgic chocolate treats, including the most perfect chocolate chip cookies in New York. 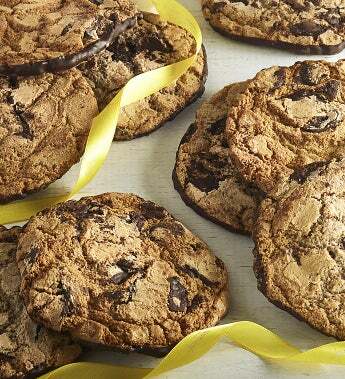 These famous gigantic chocolate bottomed cookies are sent directly from Jacque's ovens to you! These signature giant chocolate chip cookies are over 5 inches in diameter and use Jacque's House Blend 60% Dark Chocolate baking discs. As he always says "It’s a lot of chocolate with a little cookie dough around it". Sold as one or two packs of 6 cookies in a bag tied with a vibrant ribbon.